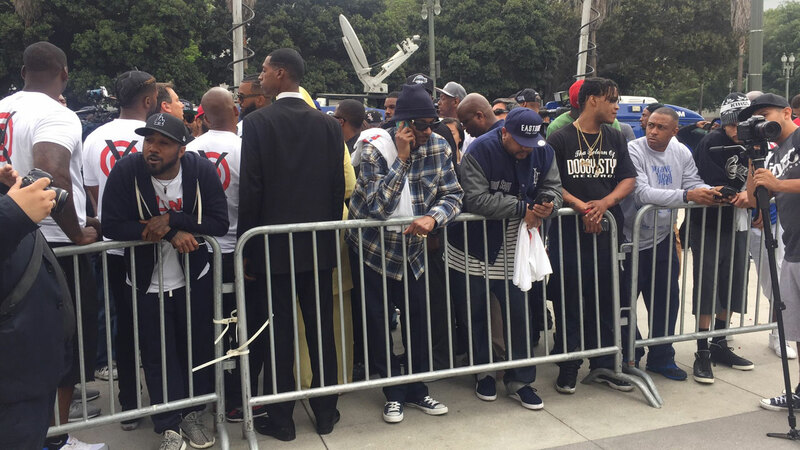 LOS ANGELES, CA -- A group of protesters that includes rappers Snoop Dogg and The Game peacefully marched out to Los Angeles police headquarters Friday morning in the wake of the Dallas shootings. More than 100 people gathered outside near West First Street around 8:30 a.m. and they remained quietly behind barricades. Snoop Dogg said the group of protesters are there to create a dialogue between the Los Angeles Police Department and the African-American community. He said an open conversation between the two communities would lead to less confrontation and violence between them. Several officers came out to greet and speak with people in the group. During the graduation ceremony, LAPD Chief Charlie Beck spoke about the Dallas killings, which left at least five officers dead. Beck told the 37 graduates that they were starting their career at a difficult time. "We have separated. We have broken into tribes. We must move beyond that. This is about America," he said. He also told the recruits family members not to be afraid for their loved ones' lives, but to be proud that they have become members of the police force. Beck and Mayor Eric Garcetti also invited Snoop Dogg and The Game into the graduation ceremony. Beck and Mayor Eric Garcetti also met with the two rappers before they all addressed the media at an 11 a.m. press conference.